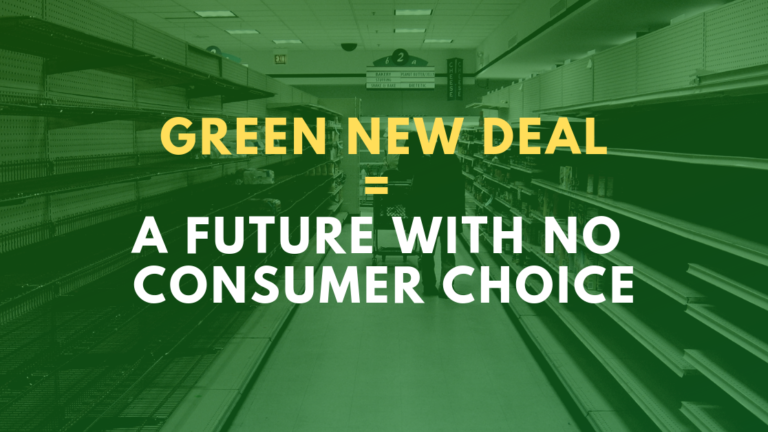 The Green New Deal offers Americans a frightening future where there is no consumer choice. This outline of a Green New Deal is probably one of the most extreme attacks on consumer choice that could be conceived of in written form. We all agree mitigating climate change is a noble and important goal, but centrally remaking the American economy and depriving millions of their ability to choose the goods and services they rely on is unfair. Not only does the plan enforce mandates that will likely bankrupt a host of industries and severely reduce output, but it also proposes to massively expand governmental control of which goods and services are offered to consumers, and in what form. If the goals of the outline are achieved, they will effectively eliminate the capacity of consumers to choose what type of fuels, products, food, or vehicles they can buy, and likely much more. Planning to eliminate vehicles that run on internal combustion engines within ten years and doing away with air travel in favor of high-speed rail is an antiquated vision that, if enforced with federal laws, would likely delay any meaningful innovations in alternative energy that consumers would otherwise be supporting in the marketplace. Requiring every building in America be retrofitted to an impossible environmental standard will rob consumers of the choice to determine how, within current zoning rules, they can build or maintain their properties. Unreasonable emission restrictions on small farms will likely make it impossible to maintain current levels of food production, thus depriving consumers of the thousands of food items they rely on. Much like the ‘shovel-ready’ jobs the ‘New Green Deal’ proposes to offer every American, we hope this proposal is shoveled as quickly as possible where it belongs: in the past. YAËL OSSOWSKI is the Deputy Director for the Consumer Choice Center (CCC). The CCC represents consumers in over 100 countries across the globe, closely monitors regulatory trends in Ottawa, Washington, Brussels, Geneva and other hotspots of regulation and informs and activates consumers to fight for consumer choice.